WASHINGTON – Right-wing federal lawmakers, led by Rep. Devin Nunes, R-Calif., are backing up state government attacks on state and local workers’ pensions through a measure that, if passed, would make the pensions virtually unaffordable. The attacks, all in the GOP-run tea party-dominated House would, in the name of “transparency,” drastically change assumptions that governments and unions must now make when figuring out whether a pension plan is solvent. The combined impact of the changes, if approved, would be to force the pension plans to stop benefits, or worse, Fire Fighters’ Legislative Director Barry Kasinitz told his union’s legislative conference delegates, meeting in D.C. in mid-March. The issue is important to millions of workers and their families. Federal data show state and local governments combined employ 16.4 million workers. Another speaker at the IAFF legislative conference calculated that Social Security does not cover some 70 percent of those workers. Originally, all were excluded. That means millions of state and local workers and their families depend on the workers’ pensions for their retirement income. Unions negotiate the pensions in contracts over the years. Non-unionists are at the mercy of employing governments. The federal attack comes as states ranging from New York to Illinois to New Jersey and cities from Baltimore to San Diego to Little Rock use budget troubles and red ink to cut public workers’ pensions. Often those governments haven’t made their required payments to workers’ pension funds, while the workers have, speakers said. Kasinitz said Nunes’ bill would virtually make a public pension plan not financially viable, by definition. And it would really penalize governments who go ahead, anyway. Nunes and other Tea Partyites first attacked pensions frontally in 2011, but IAFF and other unions led a belated education campaign that killed the scheme. Now Nunes, his 49 GOP co-sponsors and lone Democrat Mike Quigley of Illinois want to attach their anti-pension bill to another piece of legislation, behind closed doors, Kasinitz said. Nunes’ bill says any public pension plan must be absolutely “risk free” and orders it to report its rate of return on its investments to the federal government. It now reports, publicly, to state and local officials. The bill also orders a plan to assume it can earn two percent yearly, at most, on its investments – regardless of how well the plan actually performs. “There’s not a pension plan in America that would qualify” as risk free “under that two percent standard,” Kasinitz said. “And if you don’t meet that standard, the legislation says that we (the feds) take away your tax exemption for state and local bonds,” which the governments issue – anticipating tax revenues – to finance everything from workers’ pay to snow plows. “They want to create a false report” about a pension plan’s vulnerability “to create a crisis,” Kasinitz told delegates, urging them to lobby against the legislation. Another piece of GOP pension legislation would ban the feds from “bailing out” any state and local government – such as the city of Detroit, whose pension funds are severely underfunded – that declares bankruptcy. 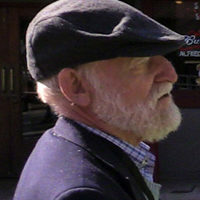 That same measure, Kasinitz said, would also “call on every state to abolish its defined benefits pension plans for public employees.” Those “traditional” pensions, with their guaranteed monthly retirement payouts, could be replaced with alternatives that pay less, either the public pension version of 401(k) plans, or “cash balance” plans. Meanwhile, some half a dozen states will be the top battlegrounds in this year’s fights over public workers’ pensions, Jordan Marks of the National Public Pension Coalition told the IAFF members. Illinois tops the list, he said. It has a $91 billion difference between available current state – not local – pension money and estimated future obligations. Gov. Pat Quinn, D-Ill., elected in 2010 with strong union support, is touring the state, Marks said, posing a choice of pensions or roads. Illinois has not made its required contributions. 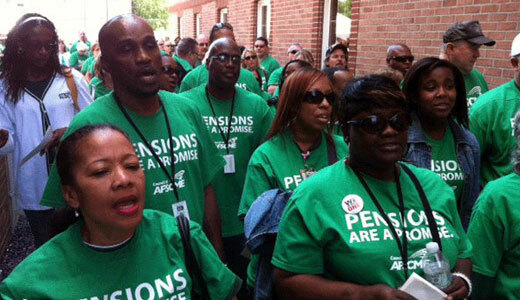 Members of state worker unions are offering to contribute 2 percent more in salary yearly. The other states are Florida, Pennsylvania, Arizona, Nevada and Louisiana. But workers have some weapons to fight back with, Marks said. They include educating state lawmakers that public workers don’t get Social Security and studies that show converting traditional state pensions to 401(k)s with state matches costs a state more money and takes pension payments out of workers’ pockets. His group, which includes the AFL-CIO, the Fire Fighters, AFSCME, SEIU and both U.S. teachers unions, can provide more data for education, Marks added.